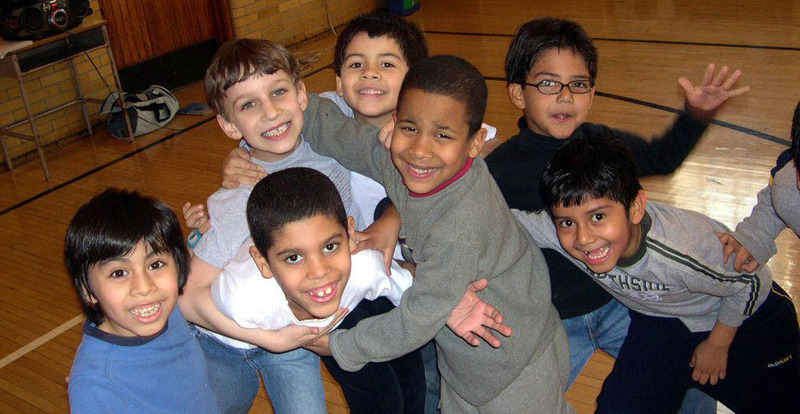 “A program that schools all over the country would envy.” Ruth Lilienstein-Gatton, parent, PS 187, Manhattan. Contracted with the New York City Department of Education since 1999, the Company has taught more than 12,000 students, from pre-K through high school within the City’s public schools. Many of our residencies have been in the primary grades. Warming the body thoroughly is a necessary daily ritual for all dancers. The warm-up is the meat and potatoes of our dancers’ diets. Or if vegetarian, the tofu and spinach! Through this we introduce a healthy, intelligent way to prepare for the athleticism of dance, prevent injuries, build strength, increase endurance, flexibility, and coordination, and introduce essentials of dance technique. Students gain an awareness of their entire body through the identification and exploration of body parts, shapes, space, directions, levels, rhythms, and time. Learning set dances, such as folk dances from around the world, or choreography by the Company, allows our students to become aware of the specificity required in dance. When learning a set dance, details such as the number of steps, or which foot to use are paramount. Our classes impart the skills students need to amass movement into phrases, learn patterns, memorize sequences, increase musicality, and dance in time with others. Dance is presented in a social, historical context that also highlights cultural connections. is the heart of our program. We teach students how to create, not what to create. The focus of this component is on improvisation and exploration. Students create dances based on spatial concepts (positive and negative space; attachments; pathways); movement invention, feelings, actions, images, words, poems, songs, stories and their own life experiences and ideas. Everyone’s abilities are validated in the class. Students learn to create independently, with a partner, and as a part of a group. All residencies conclude with an Open Class in which parents and invited guests observe the students, and then participate in learning dances alongside them. To hear what administrators and teachers say about our programs, watch our TESTIMONIALS video. For a look at special projects involving primary school students please visit the SPECIAL PROJECTS page.